Effective remedy for blood circulation, heart failure, hair growing and longevity when taken regularly and continuously. Hair Health is made from North Korean ginseng and first grade Radix Polygoni Multiflori and manufactured by employing the modern scientific method. Korean Ginseng is produced in both North and South Korea while the best is from North Korea. It is used mainly to strengthen the bodily organs, produce blood. It is sedative for mind and soul, good for liver and is an ideal nutrition for longevity. Radix Polygoni Multiflori is used to strengthen all the internal organs, the limbs, and prevents white hair. The pills are good for people in poor health, bad appetite, nervousness, and for those with constant use of brain and over-worked resulting in weak circulation of blood leading to white hair. 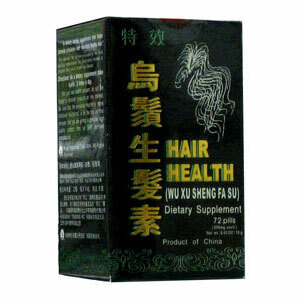 If this pills is taken constantly, there will be less white hair and it will even regenerate hair. General weakness, poor health, poor appetite, weakness due to illness, over-fatigue, poor memory, poor organ of body, white hair, and falling off of hair. 3 times daily; 6 pills for each dose.